Sea Bear Crest Hat (Tsa.an Xuu.ujee Dajangee), ​ca. 1870, Haida. 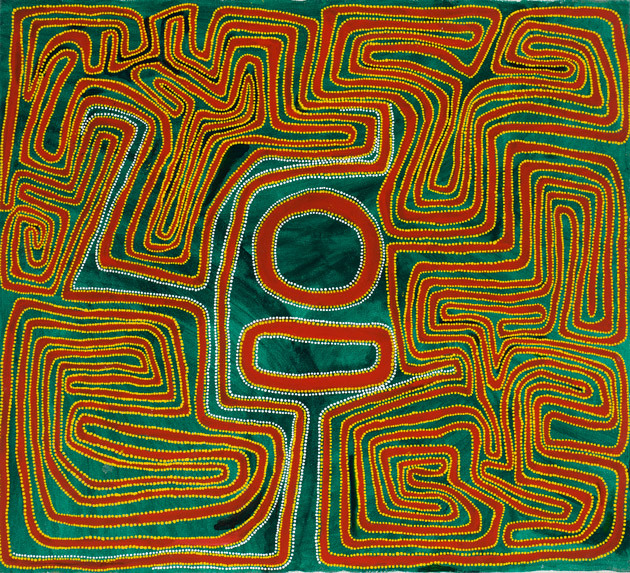 Wayampajarti, 2001, Mawukura Jimmy Nerrimah. 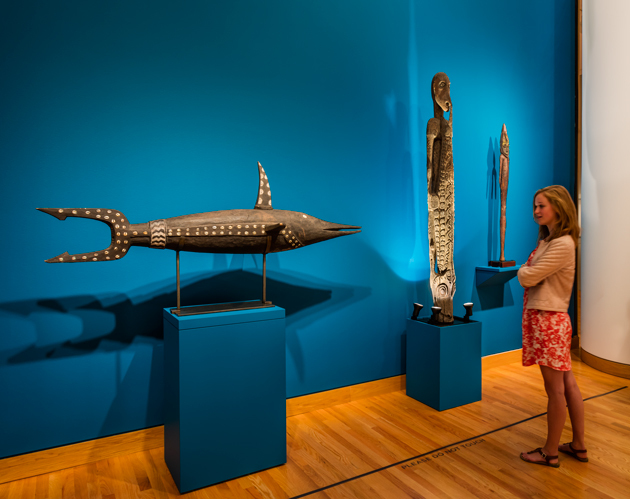 All are powerful points of inspiration for the sculptures on view here. The theme of water connects two installations, Pacific Currents and Billabong Dreams. Waterways in their myriad manifestations—rivers, Australian billabongs, saltwater seas—are not only places for navigation and subsistence. They also contain great ancestral forces that have shaped the lives and laws of indigenous people across the Pacific, as well as the sacred water sources of Australia. 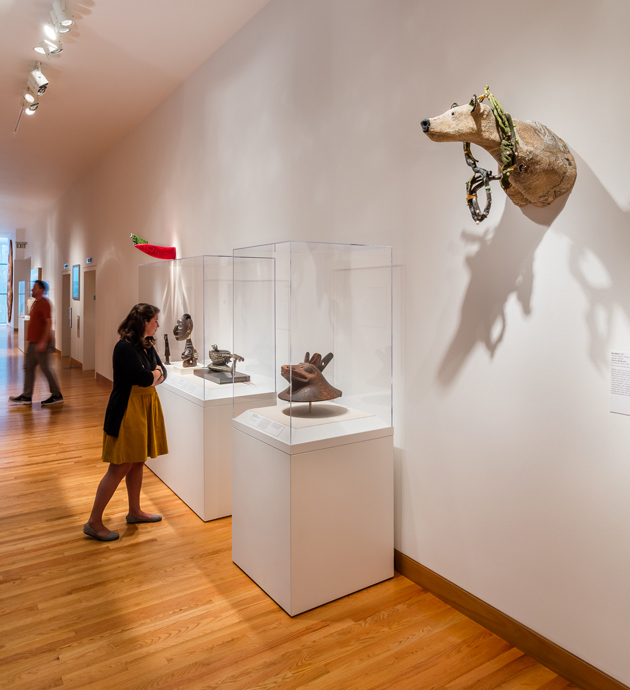 Please note: Billabong Dreams is on view through April 22, 2018. Supported by the Suquamish, Snoqualmie, Lummi, Muckleshoot and Squaxin Island tribes, People of the Salish Sea explores the inherent relationship between the Coast Salish people and the waters of the Pacific Northwest in this story of a 2014 Canoe Journey. 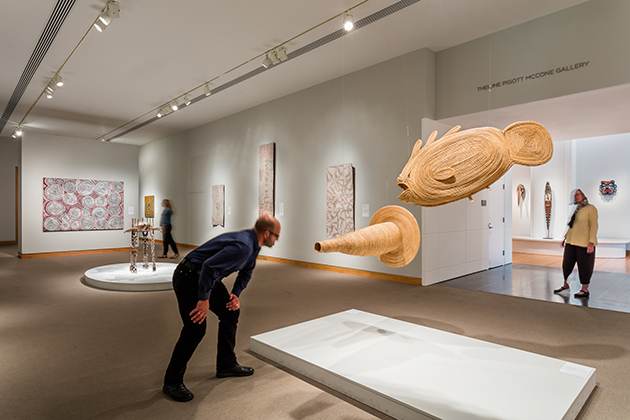 Artists from as far away as the Sepik River of New Guinea and as near as Puget Sound honor the creatures, spirits, and people who inhabit the waterways of the Pacific. These waterways are also “highways” which require special skills of navigation. 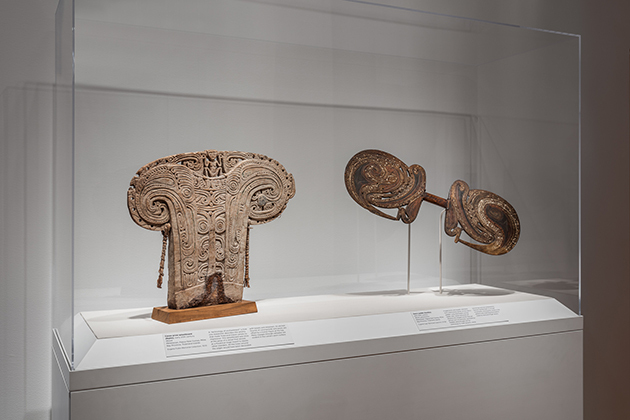 Among certain cultures, art can add a protective force or “a technology of enchantment.” Look for the Trobriand Islanders’ canoe prow, which has been worn away by saltwater, after many years of warding off danger for those who travelled vast distances. Sea Bear, 1990, SHERRY MARKOVITZ. 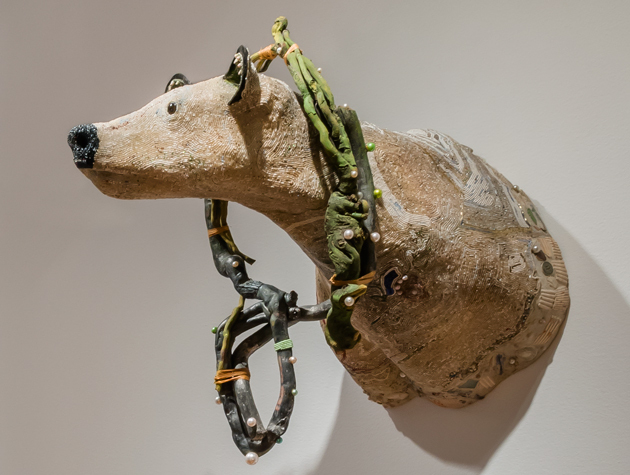 Sherry Markovitz’ beaded bear head of white opalescence beads was inspired by personal observances of the sea and sand, while the Haida wooden hat depicts the head of a bear lifted up as though emerging from the water. 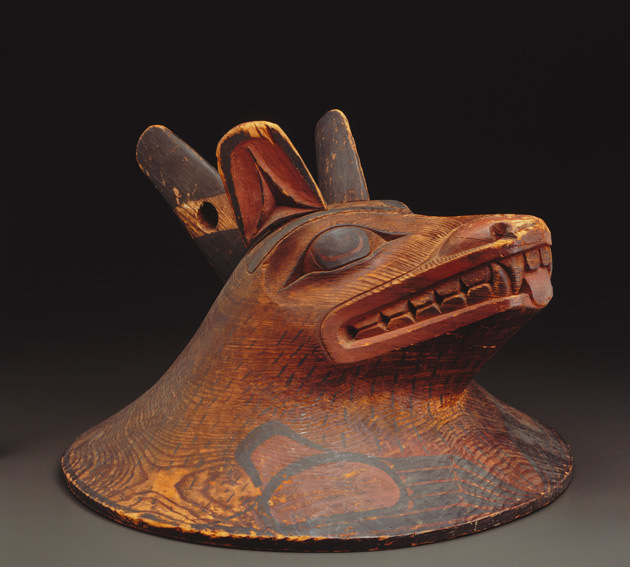 The transformation of land creature to a marine being (notice the fin behind the head) draws upon Haida oral traditions that cite the presence of such magical spirits who first appear at the beginning of time. A shark reliquary from the 19th century swims into a deep blue space, serving as a reminder of the sharks that swarm near schools of bonito fish in the waters around the Eastern Solomon Islands. Next, a man embraces a crocodile as an ancestor in a worn wood sculpture that may date as early as 1660 AD from the Sepik River. 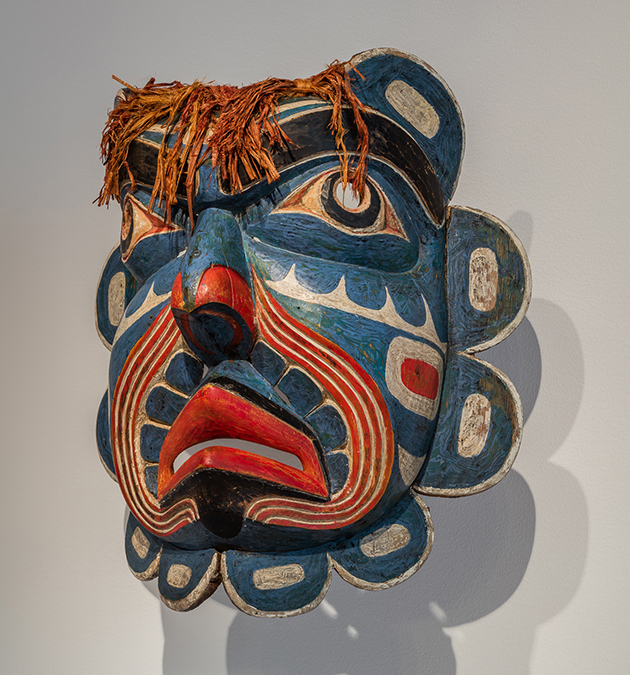 The stern face of the stone sea captain was captured in the earliest years of contact with Euroamericans by a Haida carver, while the face mask of a powerful Kwakwaka’wakw being – Nułamała, or Reckless Dancer—is in part derived from the carved lion heads observed on early sailing ships. 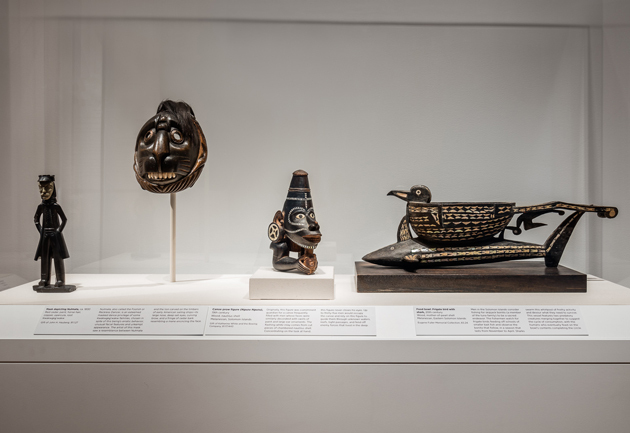 From the Solomon Islands comes the wide-eyed visage of a being who guards canoe travelers, beside a ceremonial food bowl depicting a frigate bird and a shark, predators who feed off the bounty of ocean fish. Mask of Ḱumugwe’ (Chief of the Sea), Kumukw'amhl (face mask of Kumugwe'), ca. 1880, Kwakwaka'wakw. Kumugwe’ is an awesome being in the Kwakwaka’wakw pantheon of supernatural forces. When worn during ceremony, the skilled dancer moves slowly and majestically like an ocean wave. The mask is painted the cool blue of the sea, and carved with scallops of the edge and strands of floating red kelp displayed around the mouth. The First People, 2008, Susan Point. ​Water is a complex subject to capture visually on a dry bark or a flat canvas. Australian Aboriginal artists remind us that observing water can guide life, as people consider the depths of rockholes and billabongs, the tidal ebb and flow, the rough and calm, to be an analogue for ancestral knowledge. Artists do their best to render water’s reflections, transparence, surface, depth, and many symbolic references. 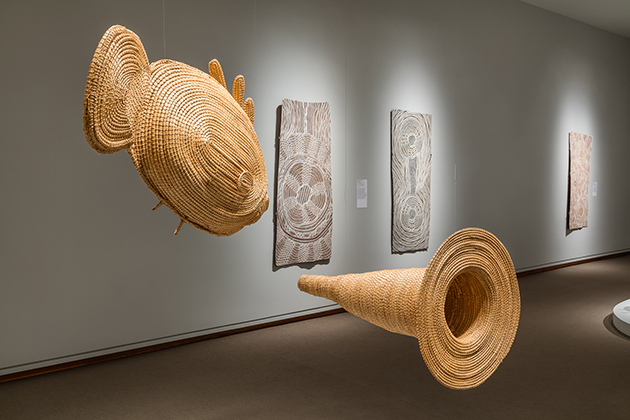 Peer down the tunnel of an eel trap and see a majestic fish known as a Murray River Cod, both depicted in native spiny sedge grass by Yvonne Koolmatrie, an artist of the Ngarrindjeri people in south Australia. ​Dennis Nona cast this turtle to remember a turtle who was once presented at a feast on decorated poles and has a stomach coated with small sucker fish. Behind the turtle is a vivid assault of circles—pulsing targets meant to deter visitors who might dare to get too close or even pollute the matrix of underground water that is essential to desert life. IMAGES: Sea Bear Crest Hat (Tsa.an Xuu.ujee Dajangee), ca. 1870, Haida, red cedar and paint, 10 1/2 x 15 3/4 in., Seattle Art Museum, Gift of John H. Hauberg, 83.228. Wayampajarti, 2001, Mawukura Jimmy Nerrimah, Australian Aboriginal, Walmajarri people, Fitzroy Crossing, Kimberley, Western Australia, born ca. 1924, synthetic polymer paint on canvas, 35 13/16 x 40 3/16 in., Promised gift of Margaret Levi and Robert Kaplan. © 2015 Artists Rights Society (ARS), New York / VISCOPY, Australia. Reproduction, including downloading of Jimmy Nerrimah works is prohibited by copyright laws and international conventions without the express written permission of Artists Rights Society (ARS), New York.​ Sea Bear, 1990, Sherry Markovitz, American, born 1947, Wood, beads, shells, fabric, paint, papier mâché, 25 x 17 x 29 in. (63.5 x 43.18 x 73.66 cm), Seattle Art Museum, Gift of Terry Hunziker, 90.3, © Sherry Markovitz. 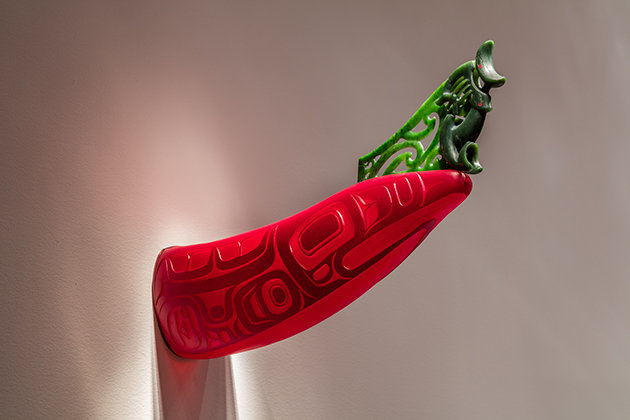 Canoe/Waka, 2007, Preston Singletary, Tlingit, born 1963, Lewis Tamihana Gardiner, Maori, born 1972, Blown and sandcarved glass, pounamu (New Zealand jade), red sealing wax inlays, steel and enamel mount, 10 × 5 × 22in. (25.4 x 12.7 x 55.9cm), Collection of Preston Singletary, © Preston Singletary and Lewis Tamihana Gardiner. Mask of Ḱumugwe’ (Chief of the Sea), Kumukw'amhl (face mask of Kumugwe'), ca. 1880, Kwakwaka'wakw, Alder, red cedar bark, cloth, paint, 19 1/4 x 17 x 6 in. (48.9 x 43.18 x 15.24 cm), Seattle Art Museum, Gift of John H. Hauberg, 91.1.30. 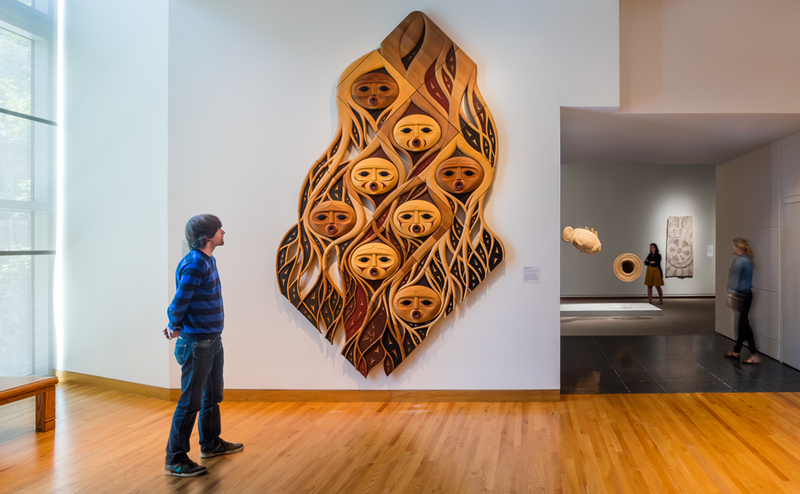 The First People, 2008, Susan Point, Canadian, Musqueam, born 1951, Red and yellow cedar, 144 x 89 in. (365.8 x 226.1cm), Seattle Art Museum, Margaret E. Fuller Purchase Fund, in honor of the 75th Anniversary of the Seattle Art Museum, 2008.31, © Susan Point. 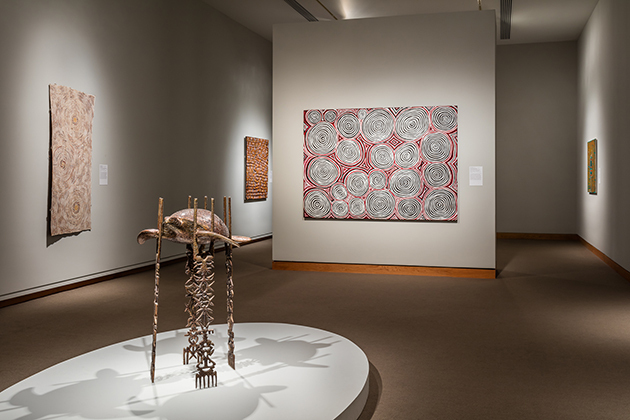 Installation views of Pacific Currents and Billabong Dreams, Photos: Nathaniel Willson.